« Restaurant Review: The New Inn, Littlemoor, Weymouth, Dorset. We found out about the Donkey Sanctuary in a leaflet whilst staying at Weymouth, Dorset. It’s quite a long drive from Weymouth, but enticed by the fact that a visit to the Sanctuary was free of charge, and knowing how much our baby daughter loves animals we drove to Sidmouth to visit the Donkey Sanctuary. We visited on the August bank holiday Monday. We expected that the roads and the sanctuary would be busy and although it took some time to drive through Lyme Regis it was well worth the drive. The donkey sanctuary is based around a visitors centre with an adjacent car park. We were directed to an overflow car park in one of the fields, a few minutes walk away from the centre. Within the visitors centre area there is a courtyard where some donkeys are normally allowed to wonder amongst the visitors. There were no donkeys in the courtyard on the day we visited, which we suspect was due to the large number of visitors which may have caused undue stress to the animals. There is also a barn area, which is primarily a warm place for the older donkeys. It was possible to get close to the donkeys in the barn and to stroke them on their heads, something that delighted our baby daughter. There is also a shop and video room, and a restaurant. The restaurant offered good food including sandwiches, salads, jacket potatoes and a selection of other hot and cold foods. The main interest in the restaurant is the selection of home made cakes, which come highly recommended! There is a toilet block with baby changing facility with the disabled toilets. Around the rest of the sanctuary are fields with donkeys in them. There are different suggested routes, one of which is considered suitable for wheelchairs and pushchairs. It was a reasonable length, nothing too taxing and quite an enjoyable walk. for Children and Donkeys, which provides donkey riding for children with special needs and disabilities. The centre was being decorated when we visited so was not in use, but the pictures and stories tell a lot about the great work that they do. 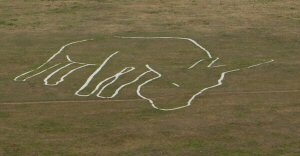 Another feature at the donkey sanctuary is a Maize Maze. We didn’t have chance to visit, but maps were available in a sealed envelope for £1. If you completed the maze without using the map then you could get a refund by returning the sealed envelope. A very worthwhile visit, highly recommended. The Donkey Sanctuary also provide welfare for working donkeys including beach donkeys. Parents who have thought about, or use beach donkeys for rides for their children may be interested in the Donkey Sanctuary’s stance on Beach Donkeys. The Donkey Sanctuary is not against the use of beach donkeys. They work with the councils and the donkey owners to provide advice, training and support to benefit the donkeys. 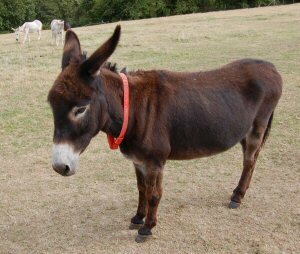 A related organisation is: El Refugio del Burrito which provides a donkey sanctuary in Spain and campaigns against poor treatment of donkeys in Spain and other European countries. This entry was posted on Sunday, September 24th, 2006 and is filed under Babies, Tourism. You can follow any responses to this entry through the RSS 2.0 feed. Both comments and pings are currently closed.